How would you like to be able to make a really superior tire pump? You can, from the plans offered here. Pumping up tires by hand is not the most fun thing to do. But if you ever need to do it, which would you prefer to do it with – a lousy one that wastes a large percentage of your effort (or may even break, leaving you without a functioning tire pump, and possibly injure you as well), or a very efficient pump that you can make yourself, that does not leak, doesn't waste your energy, and is tougher than the best factory-made tire pump money can buy? As I understand it, the U.S. military uses a tire pump that has been made for them unchanged for the past 65 years. I had been considering getting one of these pumps – not because I have frequent use for a tire pump, but because I do need one once in a while, and because – given that I do – it would appeal to me to have a really good one. Then one day, entirely by accident, I spotted a very cool looking tire pump, and naturally, since I had tire pumps on my mind at the time, it caught my eye. Because of my interest, the guy who'd made it told me about it, and even partially dismantled it to show me some of its details. The piston in this pump is more efficient than the usual leather cup seal. Leather is almost ideal for the purpose, because it is very durable, and it retains oil, but it is porous, so it wastes some of your effort in unavoidable leakage. This guy's piston solves this problem 100%. It also incorporates a simple but efficient shop-made air inlet valve, so that when you raise the plunger rod, new air is let into the pump very readily. When you start your compression stroke, the inlet valve closes, with no leakage, so the new batch of air gets compressed and sent to your tire, rather than leaking back past the inlet valve or a porous cup leather. All the parts in this guy's pump were either cheap to buy, or were readily made by any machinist from easy-to-get materials. Above is a close-up of the little check valve. 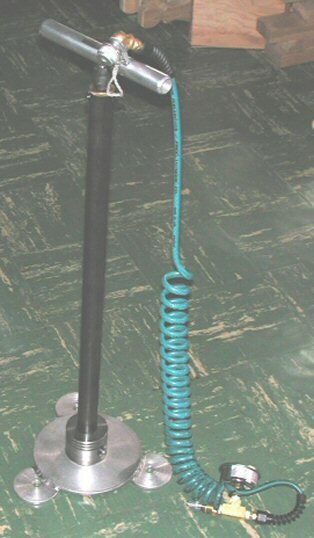 Most hand operated tire pumps are very easily knocked over, because they are tall, top-heavy and have a small base. Not this one – it has a base on it that overcomes this problem. If you give it a bump, it cockles around a little, and returns to upright. Note, however, that if you want to stow the pump in your vehicle, you can remove this base very readily by undoing one bolt. In short, this guy had made a real serious tire pump. He loaned it to me, and gave me a free hand to dismantle it and measure everything. I did so, and when I had figured out the last detail, I worked up good drawings, and then started gathering materials to make one for myself. I think I am going to have the best tire pump imaginable. I also got his ok to offer my drawings and how-to notes for sale, so you too can build a really good tire pump – it's easy to do, you'll learn some interesting things along the way, and when you're done, you'll have a tire pump that probably even beats the mil-spec one Uncle Sam uses. Also included with these plans is some excellent info on spring making, including how to calculate mandrel diameter required to produce a coil spring of a given size, using wire of a given size. I set up a bro deal for my "tire pump guys" so you can pick up the phone and get a good price for the pressure gage, the coil hose, and the fitting that clamps onto your tire's valve. (How to get this "Bro deal" is explained in the plans.) There's nothing in this for me, but it'll save you about $16 off the total you'd normally pay on these three items, if you walked in off the street and got the "cash-sale/too-bad-you-don't-have-an-account-here" price. NOTE: Rather than include photographs with the plans, I have installed several pages here on my website where you can see 27 (downloadable) photos of the tire pump and its components. This way, you get to see nice clear color pictures instead of not-so-nice photocopied black-and-white ones. Click here for the first page of photos.